Abstract. We reconstruct the pattern of surface accumulation in the region around Dome C, East Antarctica, since the last glacial. 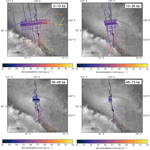 We use a set of 18 isochrones spanning all observable depths of the ice column, interpreted from various ice-penetrating radar surveys and a 1-D ice flow model to invert for accumulation rates in the region. The shallowest four isochrones are then used to calculate paleoaccumulation rates between isochrone pairs using a 1-D assumption where horizontal advection is negligible in the time interval of each layer. We observe that the large-scale (100skm) surface accumulation gradient is spatially stable through the last 73kyr, which reflects current modeled and observed precipitation gradients in the region. 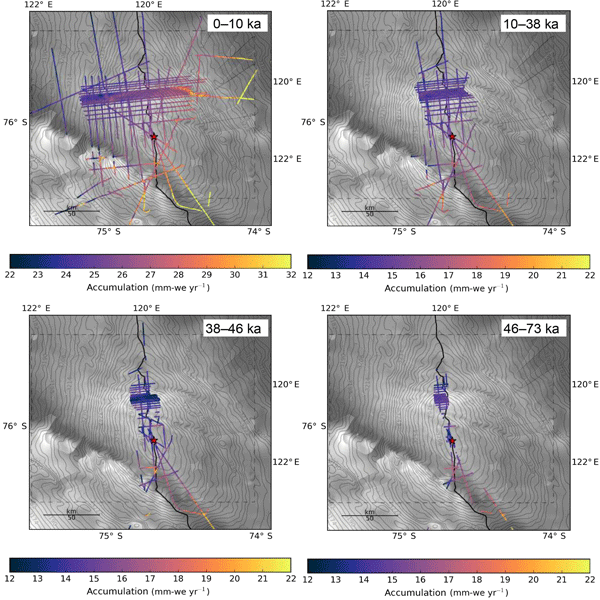 We also observe small-scale (10skm) accumulation variations linked to snow redistribution at the surface, due to changes in its slope and curvature in the prevailing wind direction that remain spatially stationary since the last glacial. How to cite: Cavitte, M. G. P., Parrenin, F., Ritz, C., Young, D. A., Van Liefferinge, B., Blankenship, D. D., Frezzotti, M., and Roberts, J. L.: Accumulation patterns around Dome C, East Antarctica, in the last 73 kyr, The Cryosphere, 12, 1401-1414, https://doi.org/10.5194/tc-12-1401-2018, 2018.